Today’s the first day of December! The last month of 2017 – where has this year gone? Many days were spent enjoying the mild winter, the beautiful spring and summer, and we’re still enjoying the fall weather. It’s been a very busy year for Ross County Tourism, a full year with a new hotel, several new events, an enormous amount of annual events and continuation of working towards World Heritage and several other projects. This year’s Annual Report will be filled with information. More on all of this information later – Let’s look into what’s coming up this December in Ross County. If you enjoy the craft bazaars, this is another busy weekend. Carver Community Center, Tabernacle Baptist Church, First Presbyterian Church, and the Hampton Inn & Suites have shows this Saturday. These shows will definitely give you a chance to find some unique items for those on your Christmas list. Downtown Chillicothe’s holiday promotional event, Hometown Holidays, continues this weekend. Santa will be in town visiting with children each weekend until Christmas. The Santa House sits at the entrance of Yoctangee Park on Water Street. Adena Mansion & Gardens hosts their annual Holidays at Adena, which offers tours of the mansion in its 19th century yuletide glory. Those attending get a glimpse of what the holiday season looked like 200 years ago. As part of the tour, the Tenant House located on the grounds will be decked out to reflect the German traditions brought to Adena through the servants who worked there. Chillicothe will once again host its Holiday Lights Tour on December 13th – 15th. Tickets are on sale now at the Transit Depot located on the corner of Watt Street and 7th Street. Tours will begin and end at the municipal parking lot on Water Street. Sit back, relax and enjoy the shows that are coming up in Ross County. Kicking off the December entertainment line-up is the monthly Movie Night at the Majestic of the classic film, It’s a Wonderful Life starring James Stewart. The historic Majestic Theatre has several returning annual shows coming up in December that includes John Berry’s Christmas Concert and Phil Dirt and the Dozers. The Chillicothe Civic Theatre will be presenting their production of Irving Berlin’s White Christmas at the Majestic on December 7th – 10th. The Paxton Theatre in Bainbridge will be offering audience a Blue Christmas with Aron Jones later in December. Aron Jones is a very talented tribute artist that brings to life the spirit and music of Elvis Presley. These are just some of the events coming up this month. For complete details about these events and to find many others, we encourage you to visit our Calendar of Events. 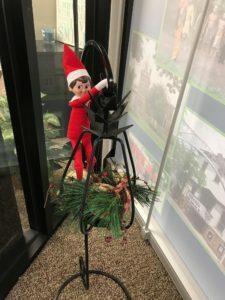 Just like many other households and offices, the Ross-Chillicothe Convention & Visitors Bureau was sent an elf to watch over us and our partners during the holiday season. Over the Thanksgiving weekend, Thomas returned to the office. He’s since been visiting our friends at the Hampton Inn & Suites and enjoying his stay with them. He will be making appearances throughout the holiday season. Make sure to like us on Facebook to keep track of his travels. Why is the elf named Thomas? His moniker was given to honor Ohio’s sixth governor and the “Father of Ohio Statehood” – Thomas Worthington.